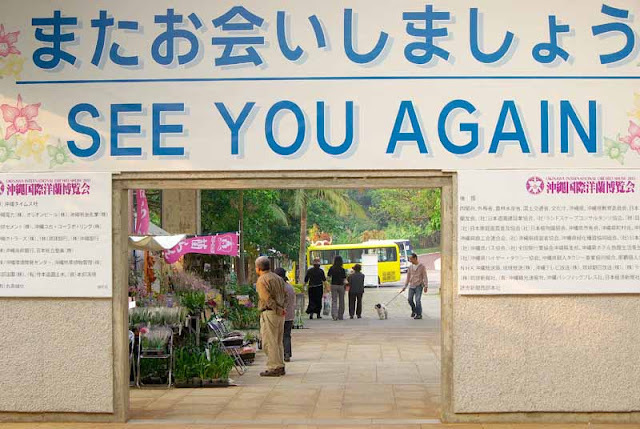 Ryukyu Life: Orchid (蘭) Lovers A Travel Photo Thursday Essay For You ! Orchid (蘭) Lovers A Travel Photo Thursday Essay For You ! 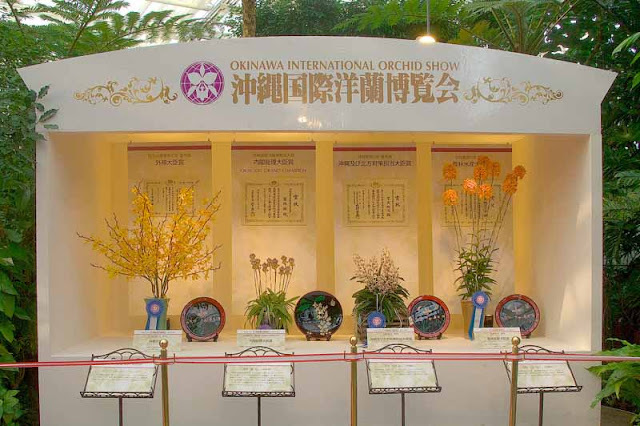 Yesterday was the first time in my life I ever attended an International Orchid (蘭) Show. Probably the last international thing, besides an airport, I've been in was one of those Houses of Pancakes. Now, your average guy isn't really wild about flowers, you know. Well, you could consider me as below average in that department. I can't understand why some folks go bananas over flowers, especially the ones you can't eat. But, I know lots of people like pictures of them so, I shot lots of photos and probably have enough ot give you an orchid of the week for the next two years. 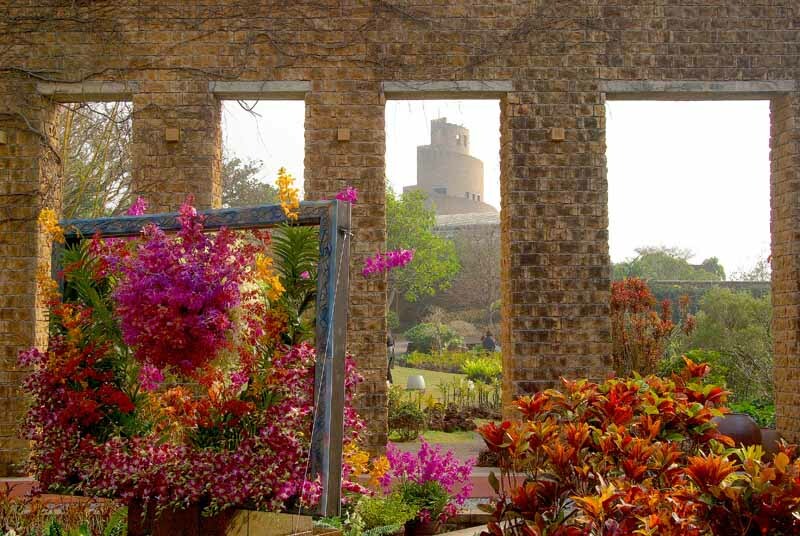 This Okinawa International Orchid Show is a big event held in the Tropical Dream Center which is part of Ocean Expo Park in Motobu Okinawa, Japan. This year it goes from 5-13 February. They have over 10,000 entries in the show every year. So, I figured it'd be best to go on a weekday and avoid all the congestion. Just imagine if each contestant just brought along one friend. There would be over 20,000 people there and not much room for visitors, like me. Well, it turned out, it wasn't so crowded. 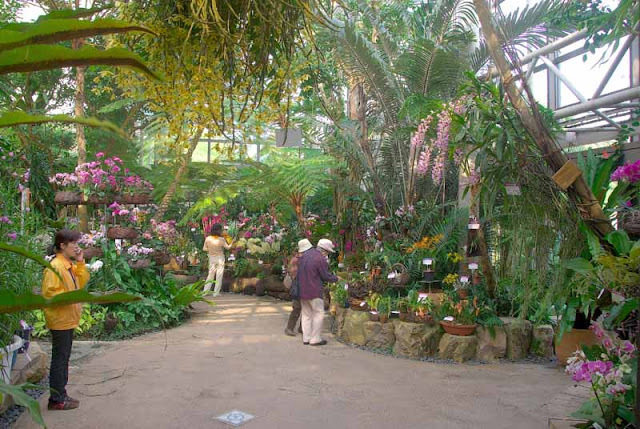 I spent a few hours there and shot hundreds of photos, mostly of orchids. I was up until 5AM this morning developing them. So, I'll just give you a quick preview in this photo essay and have my weekly post for Travel Photo Thursday done at the same time. Before even paying to enter the place (2:25PM) I shot this. 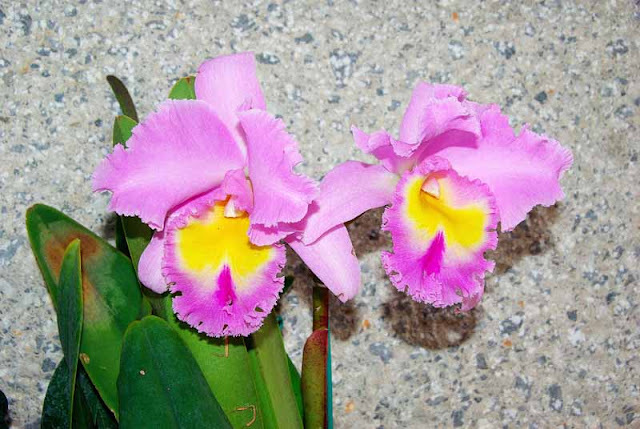 Then, showed it on my LCD screen to someone just to make sure it was really an orchid. Now, I'm not so below average in the flower department; just a little. 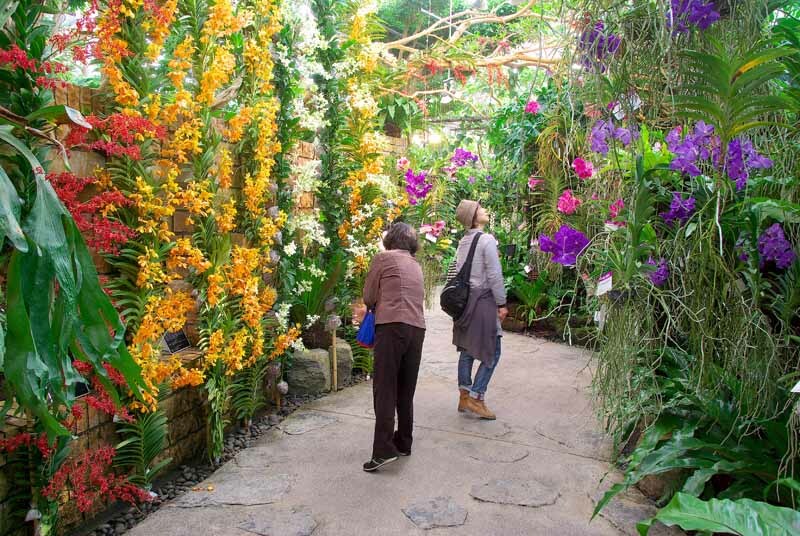 There are orchids everywhere, mostly in greenhouse-type buildings, that you can get lost in while walking in circles. I took this photo ( 2:50PM) from under a shaded area to show some of the grounds outside. The observation tower is shrouded in a combination of clouds and, I think, volcanic ash from up north of Okinawa. There are more kinds of orchids than you can imagine and people walk through the place looking up, looking down, looking all around saying stuff like, "Uuu and ahh and kirei desu, ne" while I'm saying (to myself ) "Would you hurry up and get out of my picture?" ( 3:30PM). The folks wearing yellow jackets are the Dream Center Staff and they are really polite and helpful. They must have thought I was somebody important because I saw them a few times telling people to steer clear of me. Or, it could be because I farted too loud once or twice ( 3:31PM ). Whatever it takes. After I shot way more flower and orchid photos than I'll ever have any use for I discovered this shrine-looking thing. The Grand Champions or something special is in there. It looked way too sacred for me so, I zoomed, shot a few different compositions, bowed my head and said a quick prayer, like "I need a smoke. Gotta get outa here, amen", and got out of there (4:05PM). At this point I was thinking it'd be alright if I never saw another orchid for the rest of my life, when, I came across this rabbit. 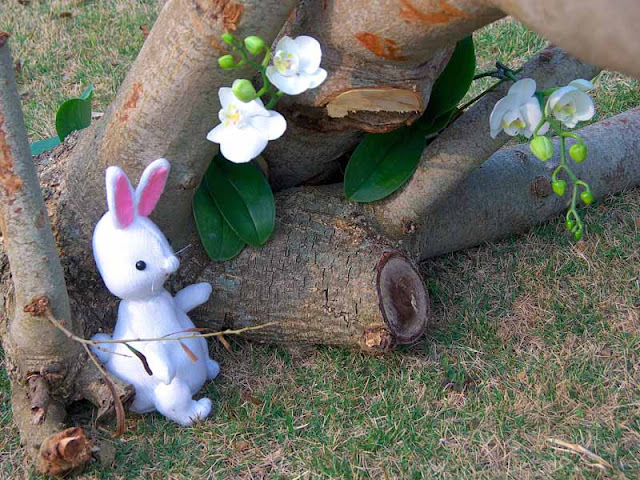 I think that may be orchids nearby, too. So, I shot them ( 4:27PM). It's the Year of the Rabbit. Now, I wonder if they had a Tiger there last year. Just a few more quick photos of the outdoors and I'd be headed home. I went to great lengths composing this photo ( 4:34PM ) and just as the shutter clicked, somebody walked into the flower arrangement in the center of the frame. Normally, I'd say "Gosh darn it" and delete but, I recognized the hat she was wearing and she's kind of a SPECIAL GIRL so, I let her stay in my picture. 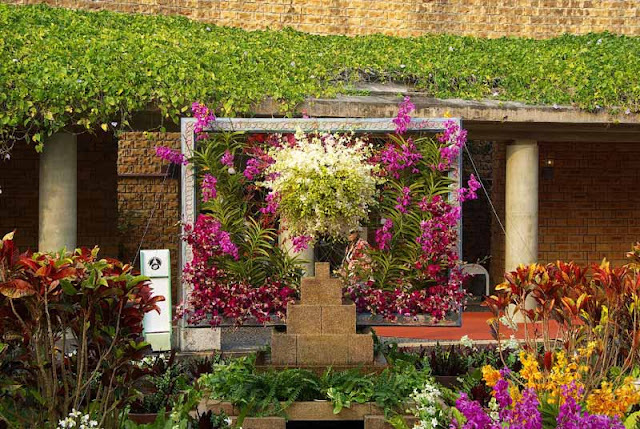 Orchid (蘭) Lovers, if you're on on near Okinawa, Japan don't miss out on this once a year event. The International Orchid Show ends this Sunday. If the flowers become really popular, I may have to open a special gallery on my website, just for them. I hope you wore your sunglasses Mike, that place is so bright, beautiful but bright. The tactical fart is a great thing, I must admit that I do use it on occasion like post office queues, supermarket aisles etc etc oh yes I'm very talented I can fart at will. Thanks for showing up for another week Travel Photo Thursday, and posting such awesome shots! We have a large, well known Orchid Greenhouse not far from us and they have an annual sale. We went to the sale a few years ago and the parking lot was full of cars with license plates from all over the US. We spent several hours wondering through the gorgeous greenhouses. these are really, really lovely shots. Nice pick-me-up on a snowy day here. Absolutely stunning Mike. I'm kind of a flower freak to when travelling. I take shots oven tiny weeds in flower, but to me they are part of the landscape many just don't appreciate. But orchids are rather special. It seems those flowers are really popular with the ladies; proof that dudes brains are different ! Guess I'll make a flower gallery and post some here more often. Thanks for the compliment and your input. Travel Photo Thursday Rocks ! One of the hazzards you face shooting indoors at these events is the floodights and spotlights they shine on the poor flowers. I figured they may not permit opening of umbrellas and using reflector boards for my shots. Now, I know I can get away with it next time. Turns out, I really had a great day there. It was a "gas", I guess you could say ! Landscapes, I agree, flowers definitely add to the scene. But, me stumbling around in a greenhouse at a flower show trying to compose flower shots, that's a whole new ballgame. I'd love to stumble upon an orchid growing in the wild, somewhere. That'd be my kinda shootin'. See you again at Travel Photo Thursday next week. I guess we're regulars there, now. Attornies generally scare me but, you seem nice enough, alright. You ain't employed by any of my Ex's, I hope! Fear not, the snow will soon melt. Thank you. I guess orchids are really more popular than I ever imagined. And now, I know they come in all shapes and sizes. The stunning photos, I'm holding back on them. Standby and I'll slip a few of the ones, I think are really stunning in a few upcoming posts and maybe, start up a flower gallery on the website.